A quarterly magazine created to communicate to a broad and influential audience innovative ideas about restoring the quality of life to America's cities. 123 links pointing to City-journal.org were found. The most used keywords in text links are City Journal, Theodore Dalrymple and City. Individual words like Journal, Dalrymple, Warfare and Theodore are frequently used in text links from other websites. The most important links to the website are from Tumblr.com and Realclearpolitics.com. The homepage of City-journal.org and the subsite /index.html are most referenced by other websites. The table shows the most important links to City-journal.org. The table is sorted in descending order by importance. The table shows websites of City-journal.org, which are often linked by other websites and therefore they are classified as important content. four profiles were found for City-journal.org in social networks. Among other social networks the website is represented in Facebook, Twitter, GooglePlus and YouTube. 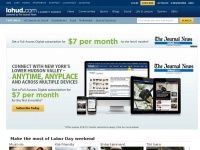 The web server used by City-journal.org is run by Champion Enterprises and is located in Auburn Hills, USA. This web server runs 1 other websites, their language is mostly english. The websites of City-journal.org are served by a Nginx web server using the operating system Ubuntu (Linux). The software used to serve the webpages was created by using the programming language PHP. For managing the data of the webpages the CMS Drupal in the version 7 is used. The website uses the latest markup standard HTML 5. The website does not specify details about the inclusion of its content in search engines. For this reason the content will be included by search engines.